Like cars, when printers, copiers and multi-function devices are not working, it is frustrating and inconvenient. Choosing whether to repair a broken device or replace it, often will depend on cost. But in calculating cost it’s important to get an accurate snapshot of the current situation. What would the cost be to repair the current machine? How much is the cost of any needed parts as well as the labor to install? How will the repair effect the office and workflow? How old is the current equipment? Was the problem created by user error? (For example using unapproved paper or feeding the machine incorrectly.) If the machine is relatively new, and the problem user induced, replacing the machine may not be the best practice. If the machine is older, it may have a limited life expectancy, and replacing it a viable option. Cash flow should be considered as well as any possible upgrades, downgrades or features needed in a new machine. When looking at replacement equipment pay particular attention to the cost of consumables—how much is toner? Does the machine require maintenance kits, how much are they and what are the yields? 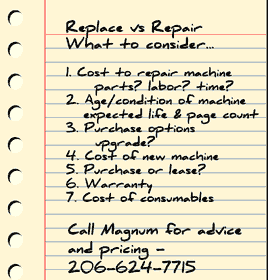 According to Magnum Service Manager, Sean Burns, there are some older, workhorse machines that are worth the price of repairing, despite their age. Machines like HP’s 4000 and 4250; early models introduced over a decade ago. “These older models just keep going, and the users are really attached to them.” While it is getting harder to find replacement parts for these older models, Burns encourages repairing them, when possible. “There are a lot of options for users when equipment breaks. We like to provide customers with education—including the total cost for a possible repair, as well as replacement options. It really depends on the individual office’s needs and what works best for their situation.” Contact info@magnumlaser.com for information on your printer needs. If you are in the market for a new printer, you may be surprised at the variety of models available and the enticingly low price tags. However, before swiping the company credit card to get the latest new deal, you will want to consider the long term costs of the equipment. Often times a low entry cost may mean high consumable costs for the life of the machine. Consumables are the toner and maintenance items a machine “consumes” to print. 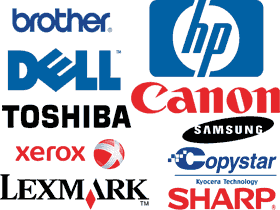 Toner supplied by the equipment manufacturer (OEM) have a much higher cost than remanufactured toner - up to 30% or more. And when a new printer hits the market, it generally takes 6-9 months for remanufactured toner to become available for that model. So when shopping for your next printer, be sure to consider the cost of consumables; it can make a big difference. How long have you worked at Magnum? I’ve been with Magnum for 7 years, I’ve been in the industry for 12. I like the diversity. I get to travel to different offices everyday. I enjoy helping, getting customer’s printers or copiers to work again; it’s very satisfying. It’s nice to develop relationships with customers over the years; watch their businesses grow. What’s the weirdest thing you’ve ever found inside a printer or copier? So several years ago I was helping to refurbish some copiers that we had gotten from a place down in Florida. I was cleaning out this one copier, and this “thing” flew out; when I took a look at it, it was like a mummified—dried out— baby alligator—about 4 inches long. I know, it was the weirdest thing I’ve ever seen. I still have no idea how it got inside that copier. Any advice to customers before calling service? Sometimes when a machine isn’t working, it’s simply a problem with the paper tray. The paper may not be loaded correctly—corners turned or something, which is not allowing the paper to feed. I’d recommend removing the paper from the tray—shuffling the paper, and then reinstalling, see if that helps. Do you have any favorite things to do when you are not saving the world from printer errors? I enjoy fishing, camping and working on my car. I love to be outdoors. When salmon season opens I like to go with my buddies near Harbor Island and we catch our limit of pink salmon and then head out to my friends lake cabin. We smoke the salmon and do more fishing in the lake. It’s a blast! Magnum believes in the power of recycling, so when we found ourselves inundated with styrene foam not accepted by our recycler, we were looking for options. As it happened, a Magnum employee came upon locally based Styro Recycle llc in their travels. 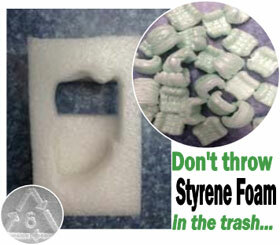 Styro Recycle is a Renton based company (located near IKEA) who accepts Styrene Foam (look for “6” or “EPS” on materials) as well as packing peanuts, cardboard, bubble wrap and plastic wrap (clean and dry only, please.) Styro Recycle offers free drop off as well as low cost pick up services for businesses. Once received, the materials are ground up and compressed into blocks which are then manufactured into plastic products such as picture frames, TV cases and more. Visit styrorecycle.com to learn about this great program.